This unique volume is a case study of a successful and innovative program using case aide volunteers to deinstitutionalize mental patients. It will serve as an important reference for professionals, teachers, and administrators who are involved in the "business" of human services and require concrete information on how to develop effective volunteer programs to bridge the widening gap between services and needs. The authors use their particular program as an empirical blueprint for principles undergirding the successful use of volunteers as extensions of professional social service staff. The case-aide handbook appended to the volume provides a "quick prescription" formula for how this volunteer program was made viable and how these techniques can be adapted to other programs. 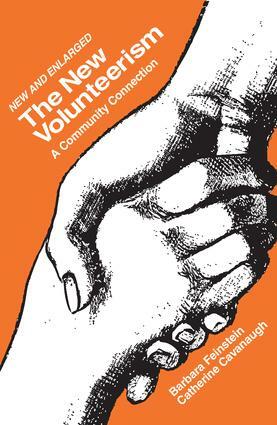 In the new and enlarged edition of The New Volunteerism, the authors tell about "whatever happened to…" the case aides in their program, based on the responses to a questionnaire they designed and mailed to 100 of these men and women. Models for Volunteer/Professional Partnerships are defined and illustrated with creative and innovative volunteer programs reviewed by Feinstein and Cavanaugh. These programs serve many different populations, including: alcoholics, the elderly, the mentally ill, the retarded, abusive parents, and the terminally ill.